Conflict is a reality in different parts of life. It can occur between different individuals, groups, communities, companies, and governments. Sometimes it seems as if though the consolidation of peace has become slow and complex. However even in the midst of conflict humans are able to build or strengthen social relations which exclude the use of violence and promote peaceful behaviour. 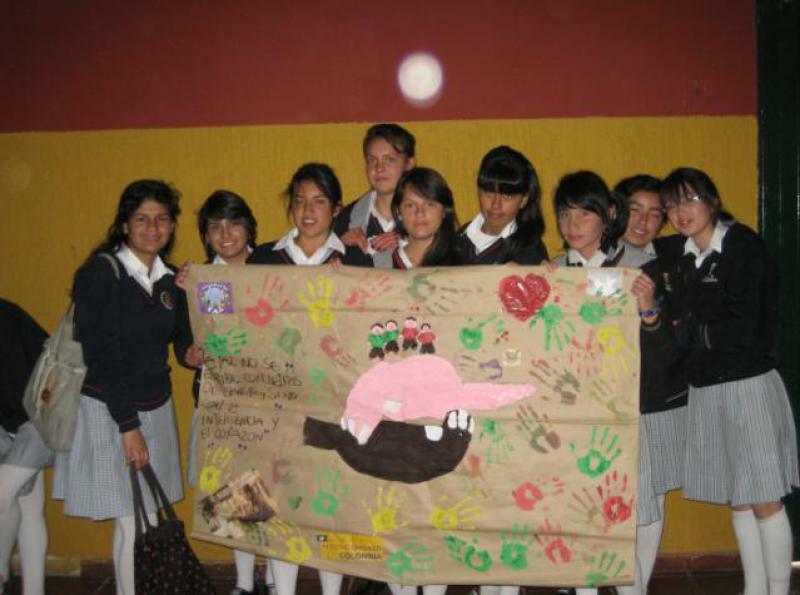 In this regard Escuelas de Paz has organised an event aimed at “PROVENTION”. PROVENTION can be defined as the action of "providing people and groups with the skills they need to deal with conflict”. Provention differs from conflict prevention in the sense that the goal is not to avoid conflict but to learn how to cope with it. This event was organised for 300 students of La Merced school of Mosquera (a town just outside of Bogota) to commemorate the International Day of Peace. The event started with a plenary presentation about the concept of conflict and Provention. To allow the students to really understand the concept of Provention, the plenary session included a participatory activity. 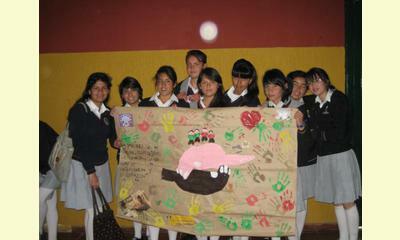 The second part of the event consisted of "My Banner for Peace". In this activity the students were asked to design a banner that represents the concept of peace and apply the concepts learned on Provention. The facilitators from Fundacion Escuelas de Paz assisted the students in creating their banner, answering questions on the topic and stimulating them to be creative. Simultaneously each of the students was given a lollypop, which included a saying about peace, such as “If we do have not peace within ourselves, it is in vain to seek it from outward sources.” François De La Rochefoucauld (1613 - 1680) Writer, aristocrat and French soldier. To conclude the activity we asked 5 students to present their banner in front of the audience and explain what they felt during the activity. The afternoon was reserved for an information session about the election of the Municipal Youth Council of Mosquera. The students were informed about their right to vote and the ability to stand as a candidate. Furthermore the importance of a Cultural of Peace in relation to democratic participation and election processes was stressed. The election process is led by the Mosquera Youth group; Mosquera Joven. Escuelas de Paz is functioning as an advisory body to this youth group. This report was posted on October 8, 2012.